Business and Finance Landing Page is fully Professional Template particularly created for finance, accounting, financial, brokerage, coaching, law office, business planning and consulting websites. Finance and Business Landing Page Template is highly clean and Modern HTML5 template. This Finance and Business template is generated for corporate website like Financial Adviser, Accountant, Consulting Firms, insurance, loan, tax help, Investment firm etc. 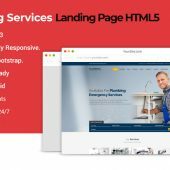 Business & Finance Landing Page Template comes with necessary features for your online presence like Projects, Video section, testimonial, Our Services and functional contact us form. This Template helps fully for online presence for Corporate Business and Financial Firms. 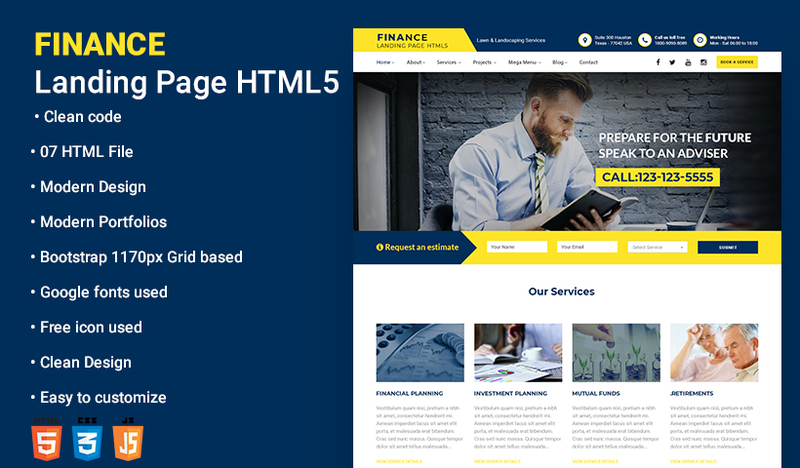 Finance Landing Page template is specially designed to take care of your business requirements for running your financial services like financial business and consultancy, financial, companies, investment agencies or management, mutual funds and other management services. Finance Landing Page Template is single page HTML, CSS and bootstrap combo business Template. It is best suited for corporate website like Financial Advisor, Accountant, Consulting Firms, tax etc. The layout is very easy to understand and easy to modify according to your needs. Finance Template is fully responsive and looks attractive at all screen sizes whether it is a desktop, laptop, tablet, or mobile. Template is bug free and has been tested on all web browsers. It has many features and can be integrated to any development platform/framework. It can be customized in a very easy way.